Governor Cuomo joined New York City Department of Environmental Protection Commissioner Vincent Sapienza, New York State Office of Parks, Recreation and Historic Preservation Commissioner Rose Harvey, New York State Assemblyman Nick Perry, The Trust for Public Land CEO Diane Regas, New York Road Runners President & CEO Michael Capiraso and President of Events and Race Director Peter Ciaccia, I.S. 598 Principal Jameela Horton-Ball, and Winthrop Campus students and faculty yesterday to announce the construction of a new green community playground. Set to be completed this fall, the playground will include a new basketball court, outdoor classroom space, fitness equipment, and running track. New green infrastructure elements including a turf field, trees and permeable pavement, will be able to capture more than one million gallons of stormwater each year, helping to protect the health of Jamaica Bay. The community playground, located on the Winthrop School campus in Brooklyn—within a ten minute walk from more than 30,000 East Flatbush residents—is the first of eight that will be transformed under the second phase of the Governor’s Vital Brooklyn initiative announced last month. By 2020, the Vital Brooklyn initiative will transform eight playgrounds, renovate 22 community gardens, and improve four recreation centers in Central Brooklyn. Yesterday’s groundbreaking was also part of The Trust for Public Land’s Playgrounds Program, which serves to create vibrant, educational, and fun playgrounds for New York City’s schoolchildren. All The Trust for Public Land playgrounds include student participation in the design process, providing them with hands-on learning of the science, math, and architecture that goes into designing playgrounds, while giving them an opportunity to voice their thoughts on what is needed in their school’s playground. Students at The Winthrop Campus, as well as parents and neighbors, got the chance to contribute to the playground design process. For more information on The Trust for Public Land, visit their website here. 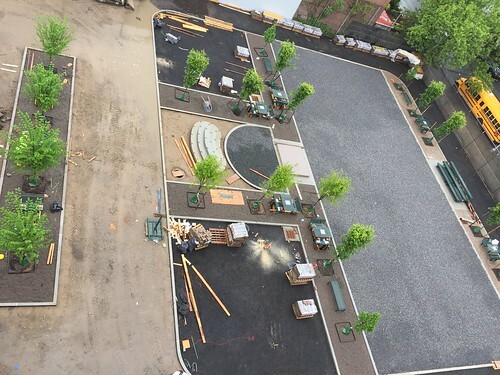 Green infrastructure design elements, made possible in part through a partnership with the New York City Department of Environmental Protection, are a hallmark of The Trust for Public Land’s playground work. These features reduce stormwater runoff that can flood streets and overwhelm sewer systems, allowing untreated water to end up in rivers and bays. Assemblyman Nick Perry, Chair, Black, Puerto Rican, Hispanic & Asian Legislative Caucus said, “With today’s groundbreaking the ambitious Vital Brooklyn Initiative begins to come to fruition, and show tangible results which will benefit the families of our community. It will be particularly satisfying, later this year, to come back to visit the school and join the children in using the beautiful outdoor space which they had a hand in designing. I salute Governor Cuomo, the Trust for Public Land, the Office of Parks, Recreation and Historic Preservation, NYC Department of Environmental Protection, Principal Horton-Bell and all others who helped make this extraordinary day possible. Announced in March 2017, Governor Cuomo’s $1.4 billion Vital Brooklyn initiative seeks to transform the Central Brooklyn region by identifying and investing in eight integrated areas that will help to establish a national paradigm for addressing chronic disparities, such as systemic violence and entrenched poverty in high-need communities. The comprehensive plan targets increased access to open spaces and recreation, including $10.6 million to transform eight schoolyards into community playgrounds and open space, $3.1 million to transform nearly two dozen community gardens, and $1.8 million to enhance four recreation centers across Central Brooklyn. This playground is made possible through a partnership with the New York State Office of Parks, Recreation and Historic Preservation, the New York City Departments of Environmental Protection and Education, the New York City School Construction Authority, and New York Road Runners. DEP manages New York City’s water supply, providing more than 1 billion gallons of high quality drinking water each day to more than 9.6 million residents, including 8.6 million in New York City. The water is delivered from a watershed that extends more than 125 miles from the city, comprising 19 reservoirs and three controlled lakes. Approximately 7,000 miles of water mains, tunnels and aqueducts bring water to homes and businesses throughout the five boroughs, and 7,500 miles of sewer lines and 96 pump stations take wastewater to 14 in-city treatment plants. DEP has nearly 6,000 employees, including almost 1,000 in the upstate watershed. In addition, DEP has a robust capital program, with a planned $19.1 billion in investments over the next 10 years that will create up to 3,000 construction-related jobs per year. For more information, visit nyc.gov/dep, like us on Facebook, or follow us on Twitter. The Trust for Public Land creates parks and protects land for people, ensuring healthy, livable communities for generations to come. Nearly ten million people live within a ten-minute walk of a Trust for Public Land park, garden, or natural area, and millions more visit these sites every year. To support The Trust for Public Land and share why nature matters to you, visit tpl.org.